75-Ball Bingo is one of the most popular forms of bingo across the globe and hands down the favorite style played in the United States. Its popularity peaked early on in the 1940s and remains to this day as what most players think of when they think of traditional bingo. To buy into a 75-ball bingo game, all you need to do is purchase numbered bingo tickets from a bingo representative in a live hall or from the digital host in an online game. The tickets for a 75-ball bingo game consist of a 5×5 grid of numbers with five across and five down. 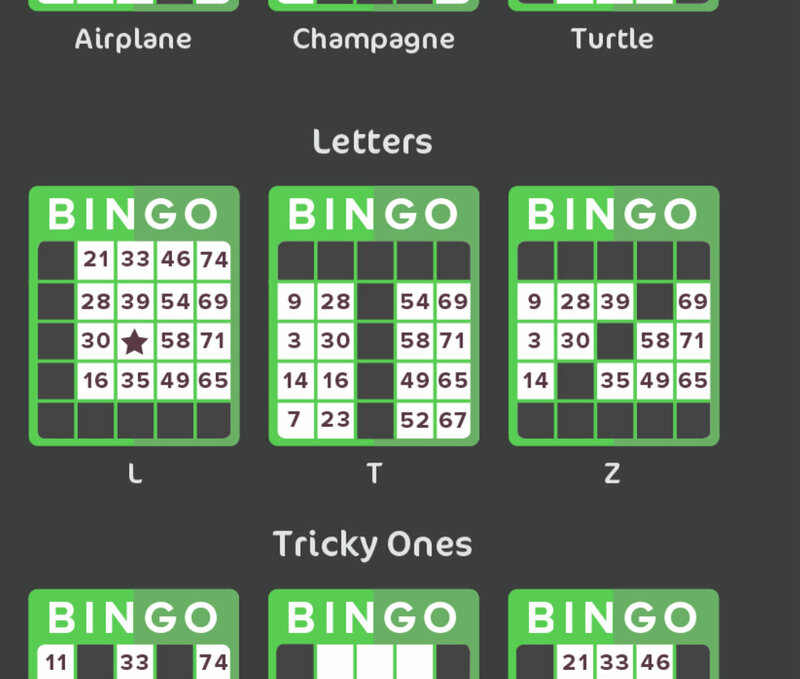 The word BINGO is displayed along the top of the card and each column of numbers is placed under a letter. The B column contains five random numbers ranging from 1 through 15. The I column contains five numbers ranging from 16 through 30. The N column contains four numbers (with one black space) ranging from 31 to 45. The G column contains five numbers ranging from 46 to 60. The O column contains five numbers ranging from 61 to 75. In the middle of each card in the N row is a blank free space that all players may use to complete their patterns. 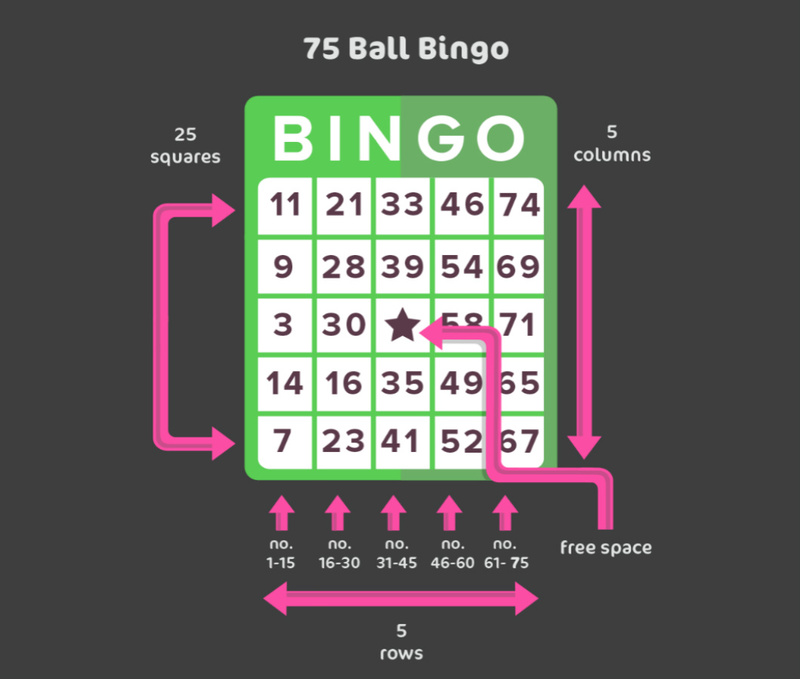 The numbers 1 through 75 are used in a standard 75-ball bingo game. In a live hall, a bingo caller will call each number one at a time until the winning card/s are identified. The same goes for an online bingo game, though the computer software will select the balls. During a game, each number will only be called out once. In a live hall, there will be an electronic board or screen that displays what numbers have been called, which will assist you in keeping track of the balls in play. Online, many sites will have an area on the screen that show the last 4-6 numbers called. 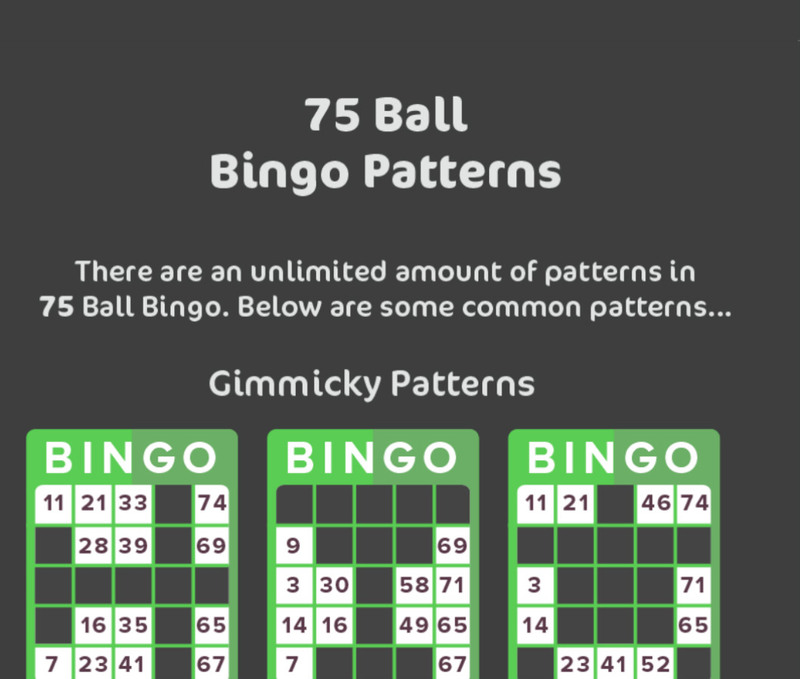 You can play 75-ball bingo with as little as one single 5×5 card. Expert live players will have a dozen or more cards per round, and online you can have dozens of cards in play. To win at 75-ball bingo, players must complete a pre-determined pattern by marking all of the numbers on the card to create the pattern. Double Line: - Complete two full lines of any combination of down, diagonal or across. X: - Complete two diagonal lines that form an “X” shape on the card. Blackout: - Cover all the spots on your card. 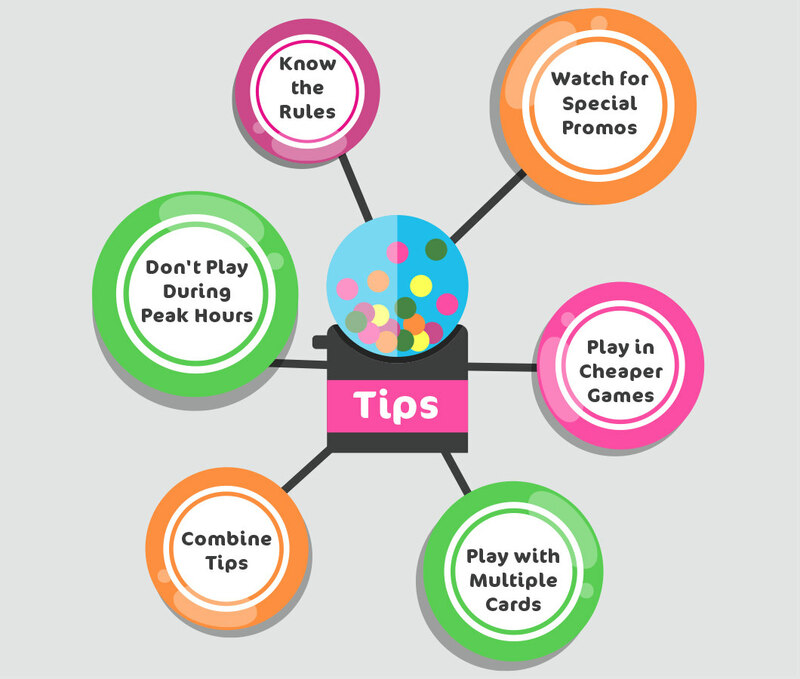 Know the Rules:- While 75-ball bingo is played the same way almost universally, each hall and online provider has their own set of rules and ways of operating that you should know about. This way you don’t have to worry about doing something wrong or accidentally making a mistake that could cost you prize money. 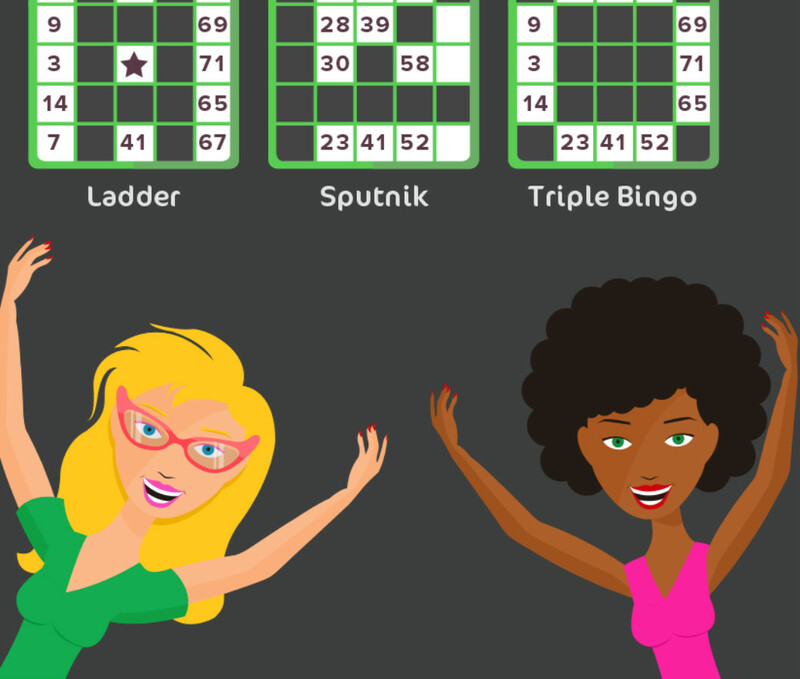 Most importantly, don’t forget that bingo is ultimately about having fun, so find the 75-ball games that you enjoy the most and you’ll never find yourself unhappy with a session.